Home » Guide » Why Build a Steel Auto Repair Shop? Are you looking at building a new steel auto repair shop or expanding your business with a steel building? Here’s a quick guide for you. Steel buildings as auto repair shops are increasingly becoming popular across the U.S. as business owners get to enjoy the huge space and the incredible functionality that they offer. Just like any structure built through conventional construction methods, auto repair shops made from steel can be customized just the way you want them to be. The main difference though is that steel building offers more versatility in terms of the additional options including windows, work bays, place doors, clear spans and much more. At the end of this article, you will learn that steel auto repair shop is the way to go when starting or expanding your car repair and detailing business. This type of construction allows more functional designs, fast erection and can be fully customized to help you provide the best service possible to your customers. The versatility of steel building is particularly important as the layout of the auto shop as well as its functionality and clear span can have a huge impact in your auto repair and detailing business. A number of big auto shops nowadays had humble beginnings. Some have probably started renting before expanding on the auto shop they constructed from the ground up. If you are someone who wants to want to achieve the same level of success, it’s important to keep in mind that conventional method of construction and remodeling could be costly and time-consuming. A steel building can be the fastest way to build a new auto shop or add an extra space and get it running without spending a lot. It also enables you easy expansion in the future. A steel building can be customized in whatever design you could imagine. It gives you the liberty to design your auto shop instead of consuming a lot of time squeezing in equipment, tools, cars and staff into a small shop. When you go for a steel auto repair shop, you are not only investing in your current business but you are also investing in the future. Since prefabricated steel buildings are a lot easier to alter, you can easily expand your steel auto repair shop and allow it to grow as your repair and detailing business does too. That saves you from the hassle of finding ways how to expand your shop the quickest time as possible. What is great about a steel auto repair shop is that you can have it fully customized to make sure your auto shop has that unique appearance that will make it stand out from its competitors. Unlike conventional construction methods where you are limited to having a cookie cutter shop that lacks originality in design and style, a steel building allows you to add some rock, glass, stone or other accessories. 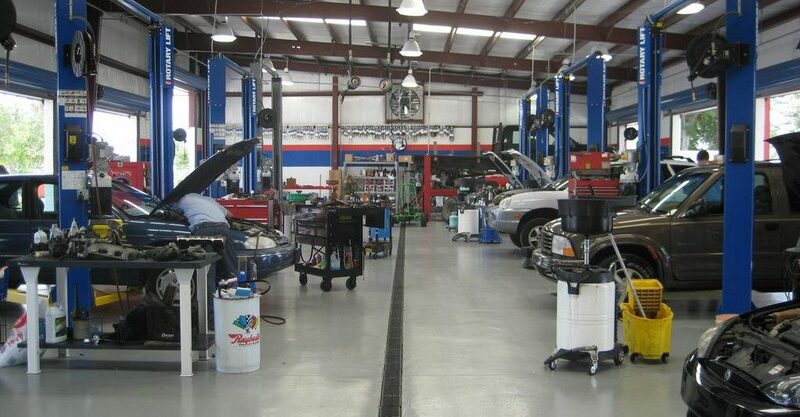 With this type of construction, you can build an auto shop that will truly reflect how you conduct business. With steel building, aside from getting exactly what you want, below are other advantages. It can be fully customized. Its versatility allows you to design your layout exactly as you need. It is designed for quick delivery and easy erection. That means you can get your shop running in just a matter of days. It allows for easy expansion in the future. At this point, you are probably now more convinced that steel building is the way to go when starting an auto repair business or expanding your shop. However, there are a few things to consider when designing. First, doors open huge profitable opportunities in an auto repair shop. If you could notice, a lot of auto repair shops have a series of doors on one sidewall. They are usually 14 feet tall so they could be able to accommodate semi-trucks. Doors are usually placed on the sidewalls for easier expansion in the future. Expanding your shop vertically in the future instead of horizontally is more cost-effective. They are rarely placed on the end walls. Moreover, by placing your doors on the sidewall, your shop can accommodate more vehicles and hence you get to maximize the space. Secondly, there are two types of doors that are usually recommended for auto shops: a roll up or a sectional. There’s not much a difference in the cost but roll up doors need more room. Third, while most steel building auto shops nowadays use a cross (x) bracing on the sidewalls, a portal frame is more recommended. This allows you easy access to each bay. Moreover, unlike cross bracing, portal frames enable maximum usage of all work bays. Cross bracing would only make one of the access doors non-functional. Hence while you can save money by going with cross bracing, one access door getting eliminated cuts back on the efficiency of your structure as a whole. Going for a portal frame will require an additional one foot in height and width. However, this is nothing compared to the cost-advantage you get from operating an additional bay for auto service. Nonetheless, if you still insist on using a cross bracing, you may use the space for storing tools and other small components. Fourth, while the design of your auto shop may vary depending on the framing you want to use, the size of each bay remains consistent. The width should range from 20 feet to 30 feet only. This is among the reasons why many prefer using steel buildings over their wooden counterparts. They enjoy the absence of interior columns to give support to the structure. Wood buildings need an interior column every seven to eight feet.